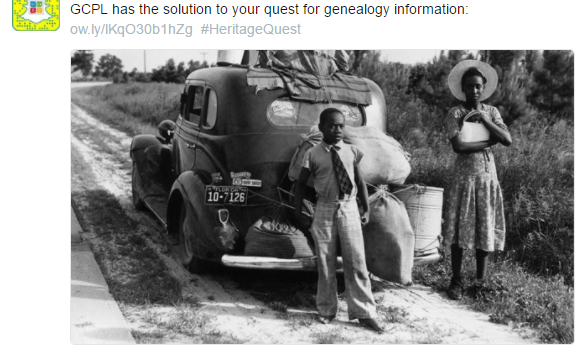 Last week my local public library tweeted “GCPL has the solution to your quest for genealogy information….#HeritageQuest”. Squirrel! 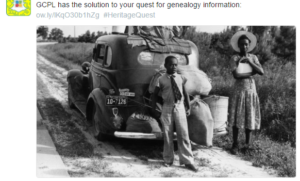 The message captured my interest and before I knew it, I was hooked on a modern day treasure hunt for information on my family lineage. 25 years ago I did some basic family research at the state archive building and found census records back to 1910. With the Heritage Quest tool from the library, I was able to view my father’s family line in the census records in every census back to 1840 (except 1890 because most original records were destroyed by fire). Time travel never felt so real. The big win is the census records are now digitized with metadata. Unlike 25 years ago, when I was searching Microfilm, I was able to complete a wide array of searches very quickly. I could use first name, last name, birth year, death year, places lived, and family members to help narrow search results. Linked to each family unit was the scanned image of the original census document for visual confirmation. Using this new capability I was able to quickly find census record data back to 1880 for my father’s family line. But I wasn’t done. Felix awaited. One challenge with the metadata is sometimes the interpretation of the original handwriting is wrong and sometimes the original census data has inconsistencies in what is recorded. There were variations in spellings, middle initials, and ages that made it difficult for me to get a match in a few of the years. So I had to examine the data in-context to find matches (approximate ages, children names, place of recording, etc.) Basically, the tools of the digital age combined with manual human intellect to solve a puzzle. Before this past week, I knew the name of my great grandfather and great-great grandfather (from my great aunt while she was living). I also knew the cemetery where my great grandmother was buried. Using the cemetery information I was able to locate her grave using the site findagrave.com. At the bottom of her gravesite record was a comment from a lineal relative of mine previously unknown to me (a distant cousin). I emailed her a question asking if she knew the name of the father of my great-great father. Within hours I had the name, Felix. Using this new information, I went back to the census search. Within a few hours I found Felix in the census records for 1880, 1870, 1860, 1850, and 1840! Hello Felix. To get to the next generation, I’ll need data from additional sources. The 1790 through 1840 census records only show head of household by name and then headcounts for other family members. I was able to match Felix in 1840 because I knew the age of his spouse and children in the 1850 census. Over the last four days, I’ve seen the power of metadata searching, optical character recognition and digitization of written records. I just hope I can find Felix through another historical document to tell me a little more. It’s a treasure hunt for another footprint in the past. It’s a story waiting to be told. « Do more with what you have!